Gold has emerged as a very important asset class specially in the last 2 years which were marked by recessionary trends, falling banks , bailout packages and countries defaulting on debt. Many new ways of holding gold as an investment are now available. But in order to maximize the gains in the gold rush, it is very important to understand the relationship between gold prices, inflation and currencies. Inflation and Gold Prices : Two years back when the economy started to slow down, the government came out with various bailout packages to control the worsening situation. This lead to an increased circulation of paper money(currency notes) in the market, which in turn fuelled inflation. This lead to a fall in purchasing power. As the economy was slowing down, returns on many asset classes specially equities were falling drastically. Gold thus emerged as a perfect hedge against the inflationary trends and also a better option for investments. Historical data reveals that gold generally appreciates faster than the inflation index. Currencies and Gold Prices : In the international markets, gold is a dollar denominated commodity. The rupee-dollar exchange rate also affects the gold prices. Indian prices of gold in terms of rupee/10gm. are based on the international prices of dollar/ounce (1 ounce = 31.1 grams). However, an increase in gold prices in the overseas market may not always lead to an increase in gold prices in India in the same proportion. To understand this, let us take a set of numbers. If the price of gold overseas is $1200 per ounce and at the same time in India a dollar is worth Rs.49, then the price of gold in India would be Rs.18,906 per 10 grams. Now, if the price of gold overseas rises to $1300 after a month and dollar falls to Rs. 45, then the price of gold in India would be Rs. 18,810 per 10 grams. Even when the prices of gold appreciated by a hundred dollars, due to a fall in dollar’s value, the prices in India could not increase in line with the overseas prices . Thus, it gives us an indication that in case of an appreciating rupee (or a falling dollar), there is always an opportunity to invest in gold as one can buy more gold for the same amount of rupee. 1. JEWELLERY : One of the most traditional ways of holding gold is in the form jewellery. We all know very well about the Indian woman’s desire to buy gold jewellery. It is because of this reason that every year, around 300 tonnes of gold find their way into the country, mostly as jewellery. This mode of investment fulfils both the needs of an Indian investor, social as well as investment needs. But jewellery is made of diluted gold, thus diluting the returns in the name of impurities, designing charges and making charges. 2. 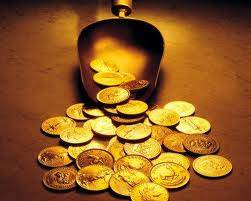 BARS AND COINS : You can buy gold bars and coins if you like the touch of your gold and want to feel rich. Gold bars and coins are usually pure forms of gold. They can be bought from jewellers, banks and NBFCs. They are available in different denominations from 1 gram to 100 grams. If you are buying bars and coins in very small denominations then you may end up shelling out more as making charges/premium. While buying bars and coins, make sure that the seller is a reputed person/entity with proper certifications. 3. GOLD ETF(Exchange Traded Fund) : Instead of holding gold in physical form, it can also be held in paper or electronic form through Gold ETF. Gold Exchange Traded Funds (ETFs) are issued by fund houses and are backed by physical gold held in your name. When you buy a gold ETF, the fund house creates units that reflect the gold holding in your name. When you sell the ETF, the units get extinguished accordingly. For buying Gold ETF, you first need to have a demat account . Craze for Gold ETFs is increasing as it avoids the hassles of storage and safe keeping. It also provides the necessary liquidity as its units can be easily traded on the stock exchange. 4. FUTURES MARKET : Gold can also be bought in the futures market through the various commodity exchanges. In futures market, people enter into contracts to buy and sell gold at a predetermined price that are settled on the expiry date. However, this mode is used more for the purpose of speculation. Charges - Designing charges and making charges/premium are charged when gold is physically bought whereas the fund houses charges fund management and brokerage costs. Looking at the financial goals, needs and the pros & cons, you should decide the mode of investment in gold. Ideally gold should comprise of 10 to 15 percent of your portfolio. It acts as an insurance of our portfolio and limits the downfall. Investments in gold should be made systematically over a period of time. If you are taking the electronic route of holding gold, this can be easily done by giving standing instructions to your broker to buy a certain quantity of gold ETFs every month. Investments in gold should always be made with long term perspective. Gold should be bought from reputed vendors so that you are assured about the purity. The purpose of buying gold in physical form must be clear from the very beginning. If it is for the purpose of financial security and not as a part of family jewellery, then you should look for exit opportunities. Whenever there is a sharp run, sell your gold and encash your gains. But what will be right price to sell your gold? Some experts believe that gold prices may cross the Rs.30,000 mark in the years to come. Some believe that it may even go higher. No one knows when will the gold bubble burst, but it seems that the day is still not near. As it is said that "make hay while the sun shines" similarly, "make money while the gold shines" , because MONEY MATTERS. 2 Respones to "GOLDEN FUTURE WITH GOLD"